Christmas in the Big Woods is an abbreviated adaptation of Little House in the Big Woods by Laura Ingalls Wilder that tells the story of the the Ingalls family Christmas in the little log cabin in the Wisconsin woods. Laura has a wonderful Christmas when her aunt, uncle, and cousins come to visit her and her family. The little cabin is full of people, and the children have lots of fun playing in the snow together. All the children wake up on Christmas morning with presents in their stockings, and Laura is thrilled to receive a new doll. Together, Pa, Ma, Mary, Laura, Carrie and the rest of the family have a splendid Christmas in the little log house! This book is an easy introduction for young readers to the classic Little House series. An Adaptation of Farmer Boy by Laura Ingalls Wilder, Winter on the Farm tells about Almonzo Wilder and his life on the family farm in New York during the cold winter. Almonzo, his brother Royal, and their father spend the day in the barn petting horses, milking cows, cleaning stalls, and taking care of the other animals. At the end of a long day of farm work, Almonzo and his family eat a delicious dinner together finished off with some pumpkin pie by the warm fire. Almonzo loves being a farmer boy! This book is an easy-to-read introduction to the memorable character, Almonzo, who would one day grow up to marry Laura Ingalls. A Little House Christmas Treasury by Laura Ingalls Wilder features festive holiday stories from the beloved Little House series. Stories included in this treasury include "Christmas in the Big Woods," "Christmas on the Prairie," "Christmas on Plum Creek," "Christmas for Farmer Boy," "Christmas During the Long Winter," and "Christmas in the Golden Years." The Rod & Staff Grade 1 Math Student Book (Part 1) uses a mastery approach when teaching mathematics. This means that the student will spend a significant amount of time on one particular skill, such as addition or subtraction, in order to master said skill before moving on. Our primary copybooks teach penmanship, basic grammar, spelling, literature, accuracy, attention to detail, and memory—all through the simple skill of copying. We have selected Scripture from the King James Bible (chosen for its poetic verse) and classic children’s poems, such as those by Robert Louis Stevenson, which describe the world in charming detail. The clean, facing pages provide plenty of space for your neophyte to draw and color the glorious passages provided. In years to come, you will cherish these journals of your child’s work. 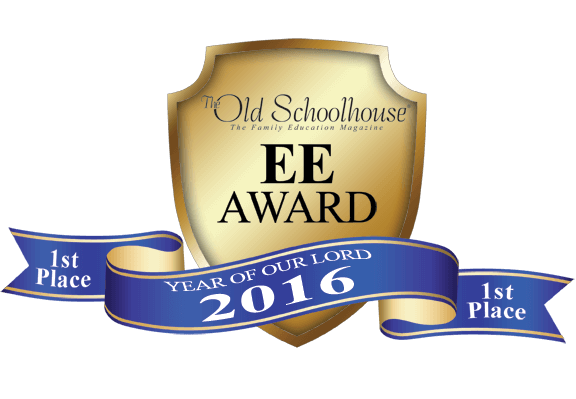 We created this chart upon the request of our homeschool customers. This poster-sized chart (22" x 34") has the alphabet listed in manuscript and cursive. If you don't have the wall space for our Alphabet Wall Charts, this poster is the perfect resource for your students. The goal of this workbook is to solidify the cursive students learned in New American Cursive 1 so that they smoothly transition to New American Cursive 2 in the fall. Summer Cursive is arranged in lessons to be completed three times a week during the summer. Each 2-page spread has letter review and sentences for students to copy that are taken from Scripture, science, famous quotations, English grammar rules, etc. So students review basic facts and Scripture while practicing their cursive penmanship. The First Grade Enrichment Guide is organized by week, matching our Classical Core Curriculum First Grade program. The week-by-week plan is organized for you the teacher to incorporate activities to bring books alive for your student! After completing our Kindergarten phonics program, first graders are prepared to plunge right into real books, such as the five little classics in the StoryTime Treasures set. Books to be read along with the StoryTime Treasures program include Little Bear, Frog and Toad are Friends, Caps for Sale, and Make Way for Ducklings. Real books, as opposed to controlled vocabulary readers, capture the imagination of children and motivate them in their reading lessons. Our study guide, StoryTime Treasures, written by Highlands Latin School teachers Mary Lynn Ross and Tessa Tiemann, teaches a variety of language skills in the engaging context of favorite books. Vocabulary, spelling, composition, capitalization, punctuation, and more are included. 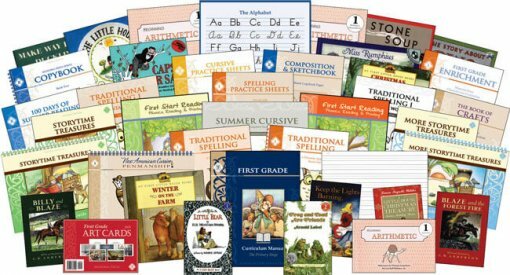 Your child’s classical education will be off to a superb start with these enduring and timeless classics. You can make this a full-year program in first grade by also completing More StoryTime Treasures. The StoryTime Treasures Teacher Guide, Second Edition gives you all the answers to the questions, vocabulary, and activities, found in StoryTime Treasures, as well as essential and recommended phonetic activities for every lesson, so you have the tools you need to guide your student through this first grade literature program! The Caldecott Honor Medal winning Frog and Toad Are Friends by Arnold Lobel introduces young readers to the unforgettable Frog and Toad. Together the friends go swimming, find missing buttons, wake each other up, tell stories, and write letters. Children will love reading about the antics of Frog and Toad and the many adventures these best friends share. Reading is a subject that should continue through the summer to avoid regression. These new summer reading journals are the perfect way to encourage young children to continue working on reading fluency as well as exposing them to good literature. The font size gets smaller for each journal and each page is divided in half for drawing and writing small summaries. 100 Days of Summer Reading II for rising second graders encourages students to read high quality literature and think deeply about what they have read. Based on years of research, Memoria Press is pleased to offer their First Grade Curriculum, the third year of our planned Junior K-12 Classical Core Curriculum. Now your child can have a Highlands Latin education at home using the very same materials our teachers use in our highly acclaimed programs. By following the daily lesson plans in our full-year Curriculum Guide, you will have every tool you need to give your child the very best education possible. » New to Memoria Press? You will need this New User Add-On Set. *PLEASE NOTE: The Rod & Staff Practice Sheets are not a part of the First Grade Package, as they were included in the Kindergarten Package and Rod & Staff has given reproduction rights to the customer, as explained in the R&S Math 1 Teacher Manual. The First Grade Classical Core Curriculum is a complete classical Christian curriculum that emphasizes the traditional liberal arts of language and mathematics and the cultural heritage of the Christian West as expressed in the great works of history and literature. 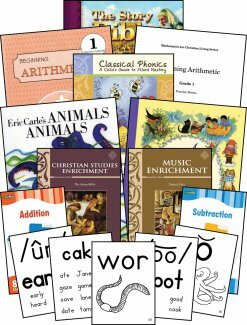 In the curriculum package, Memoria Press has designed and laid out a full year’s plan in a Curriculum Manual that provides day-by-day lesson plans for you the teacher! Picking up where Kindergarten left off, your first grader will continue to master their phonics, math, reading and handwriting. Along with an enrichment program that explores art, music, and poetry. Need to customize? Not a problem. Customizing your First Grade Curriculum is easy. Just click the “Customize” button and make your selections from the different modules. If you need help along the way, or just simply need suggestions, please contact a Memoria Press team member today! Wonderful, amazing, glorious. This company is the best out there. My child learned so much, and really learned so much more than I even thought. MP is wonderful to work with, will answer any and all questions, and respond super quickly to emails. Wonderful curriculum! 1. I firmly believe that classical education is the most rigorous well rounded type of education. I cannot imagine not instilling a basic understanding of Latin, astronomy, and understanding of Greek and Roman thinking in my children. This being said, I have extreme difficulty finding classical curriculum that is not overtly Pagan. For an example, one textbook wanted my children to build a Pagan temple as soon as they opened the textbook. The lack of discernment is almost always evident in classical education. For an example, I often find that Classical schools and curriculum have middle and high school students reading Mein Kampf and Communist Manifesto. I am appalled that educators would put this garbage in the minds of children. While studying history is important, putting children inside the mind of Hitler or Karl Marx is exceedingly dangerous. Memoria Press is the only Classical Education curriculum developers I have found who clearly exercise great discernment and provide an education that does not disturb me, as a Christian educator. 2. I LOVE the quality literature approach to education. 3. Children learn to read with pure phonics. You won’t find the disturbing word recognition approach used by public schools here. 4. Charlotte Mason’s influence is overtly obvious in this curriculum. The short lessons, high quality literature, copy work, narration, and nature walks makes this curriculum a hit for my family. I firmly believe that MP is the absolute best! I am so pleased to find my love of Classical Education, Christianity, Charlotte Mason, and quality classic literature all wrapped up in one beautiful package! I love the first grade package! The reading books they have picked out are excellent quality inside and out. Our family enjoys doing the art cards and music lessons around the dinner table. My husband and I love them just as much as the kiddos do. There is so much material here, but it isn’t overwhelming. Memoria really has an organized way of doing things.